On Thursday a jury found Jamal George guilty of inflicting grievous bodily harm but Orlana Moulon, who faced a similar charge, was not guilty. The jury reached that verdict after a trial spanning six days at the Roseau High Court before Justice Birnie Stephenson. 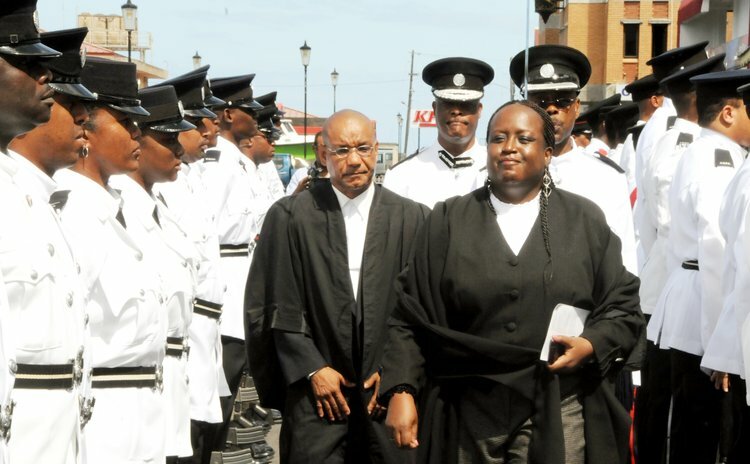 Acting Director of Public Prosecutions, Levi Peter, and State Attorney Sherma Dalrymple called eight witnesses. The accused Erwin Jamal George and Orlana Moulon were represented by Wayne Norde and Peter Alleyne respectively. According to evidence presented in the case, George and Moulon along with Moulon's four-year old son were at the entrance of the KFC drive through on the Roseau River Bank about 9:30 on the evening of Friday October 29, 2010 when they saw Kim Peterson, George's ex-girlfriend, and two friends – Alyssa Brumant and Handy Bellot- walking in a westerly direction. In testimony under oath the accused told the court that Peterson and her friends were walking on the northern side of the river bank when Kim Peterson crossed the road to the side where the car was, passed across its front and emptied a bottle of Mackeson stout on Erwin Jamal George's head. She then walked away in the direction of the KFC entrance about 22 feet away. Moulon told Jamal to forget Kim because her son was in the vehicle and the car could be cleaned anyway. Orlana turned around and saw Kim walking back in the direction of the car. George heard a huge sound like someone pounding on the driver's side on the window and he saw it was Kim Peterson. He lowered the glass to avoid it being broken and George received two lashes with the Mackeson bottle to the right side of his neck; in the region of the ear, added Moulon. Jamal opened the car's door and was halfway out when he wrestled the bottle away from Kim. Kim turned away and then returned to hit Jamal in the face with a container. Jamal removed his shirt and went out of the car and Kim began to wrestle with him. Orlana came out of the vehicle and held on to Kim at the waist and pulled her away from the car. "We both fell. I got up and Kim began firing kicks…" She got back in the vehicle and asked Jamal to leave the area, and they drove to the Roseau Police Station to make a report. While there, Kim came along and said to Erwin, see what you do to my eyes. The officer asked her to step outside. Meanwhile, Kim Peterson, Alyssa Brumant and Handy Bellot said they were on their way to the Roseau Bay Front that nigh in October 2010 and stopped at Pizza Palace, east on the Roseau River Bank. Kim had a Mackeson Stout and Alyssa a Carib Beer. After about five minutes they resumed their journey to the Bay Front along the River Bank. Close to KFC they noticed Jamal's car in the drive-way of KFC drive-through. The two women crossed the road and passed to the side of Jamal's car. Kim said Jamal stretched his arm out of the vehicle door and grabber her arm. "I told him to let me go. He didn't. He kept pulling me over. Then I bent to see who was in the vehicle and I saw Orlana Moulon sitting in the vehicle with her son sitting on her. So I poured some of the Mackeson on his head. He started firing punches. He hit me on my chest. I hit him back in his head. I felt someone grab my hair from behind, and I fell to the floor." Afterwards, Dr Carl Munro examined Kim at the Princess Margaret Hospital. He treated and discharged her, and asked her to follow up with ophthalmologist Dr Hazel Gloria Shillingford-Ricketts. Dr Munro opined that the injury to the eye could have been caused by a blunt object. Dr Shillingford Ricketts saw the patient Kim Peterson on Wednesday November 3, 2010. She was seeing double, bleeding from right nostril. Without treatment acuity in the right eye would be 10/40 and the left eye would be 10/10. But she complained of pain in the right eye and seeing double. Because of the fractures, the right eye was slightly displaced backward. Dr Shillingford-Ricketts recommended further treatment overseas. Woman Police Constable Giselle Ismael investigated the case. She, eventually, on Tuesday November 2010 charged Erwin Jamal George and Orlana Moulon with unlawfully and maliciously causing grievous bodily harm and unlawfully and maliciously inflicting grievous bodily harm on Kim Peterson. Judge Stevenson is scheduled to sentence George on November 6, 2013.